This is painted on an 8 x 16 x 2" canvas. Hope you all have a great week and prayers for Texas! 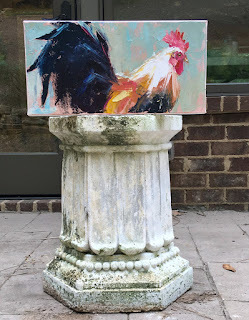 Does a loose rooster make for lots of happy hens? LOL Sorry, I couldn't resist. He's gorgeous and that pedestal is really cool. The rooster is perfectly painted!!!! The pedestal is such a beautiful find Carol!!! !